Cisco is committed to providing the best access points, client adapters, and bridges in the industry-and is also committed to providing a complete solution for any wireless LAN deployment. Cisco has the widest range of antennas, cable, and accessories available from any wireless manufacturer. Cisco offers a complete range of 2.4 GHz and 5 GHz antennas for access point and bridge equipment that enable a customized wireless solution for almost any installation. With the Cisco directional and omnidirectional antennas, low-loss cable, mounting hardware, and other accessories, installers can customize a wireless solution that meets the requirements of even the most challenging applications. 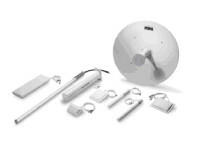 Cisco Aironet 5 GHz access point antennas have RP-TNC connectors and are compatible with Cisco Aironet 1200 Series and 1230AG Series access points when equipped with a RM22A radio module. Selection of the appropriate antenna should provide optimal coverage for the desired application in the 5 GHz frequency band.